British Prime Minister Theresa May has left the chancellery in Berlin after meeting for about an hour and a half with German Chancellor Angela Merkel as she seeks European leaders' approval for another delay to Brexit. The prime minister is meeting all 27 leaders of the other European Union countries in Brussels on Wednesday. 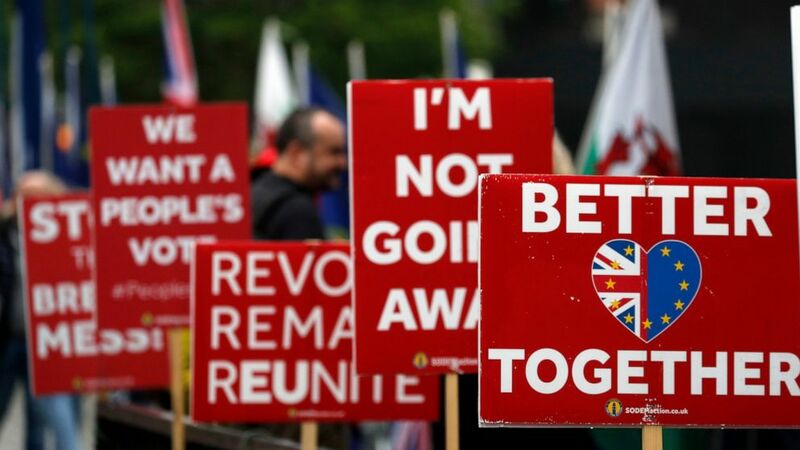 She needs their approval for a second extension to Britain's membership of the EU; if they refuse, Britain faces a sudden and chaotic departure Friday. Half a dozen of EU nations are seeking to meet ahead of Wednesday's summit to coordinate their approach to the request of Britain to further extend the Brexit deadline. An official, who asked not to be identified because the informal meeting was not officially announced, said leaders of France, Netherlands, Ireland, Belgium, Sweden and Denmark would discuss options some hours ahead of Wednesday's dinner summit. British Prime Minister Theresa May has arrived at German Chancellor Angela Merkel's office in Berlin on a quest to secure the agreement of Britain's European Union partners to a further delay to Brexit. May will meet leaders of the EU's other 27 members in Brussels on Wednesday for a summit at which they will decide whether to allow Britain to delay its withdrawal beyond the current deadline, set for Friday. If they refuse, Britain faces a sudden and chaotic exit at the end of the week. A senior member of Theresa May's government says cross-party talks aimed at breaking the impasse over Britain's divorce from the European Union are moving forward in a "genuine and sincere" way. Justice Secretary David Gauke told the BBC that it's too early to say whether the talks between the government and opposition Labour Party will be successful but work is continuing to identify a compromise, two days before EU leaders decide whether to grant a further extension to the Brexit process. France is vowing that the 27 EU nations facing the United Kingdom in Brexit divorce proceedings will remain united at Wednesday's summit, where they need to agree whether to give Prime Minister Theresa May another deadline extension. Michael Roth, Germany's deputy foreign minister, said as he arrived at a European Union meeting in Luxembourg Tuesday that "so far absolutely nothing has changed" and "we are in a very, very frustrating situation here." May has asked for a new delay until June 30. The bloc's leaders are due to meet Wednesday to consider the request. May is visiting Berlin and Paris later Tuesday.